During my years in the Aerospace industry, I used many Hi-Tech products not available to the public. Decades later, I am applying my Aerospace knowledge to my career in the marine industry. The most common problems I see are: blistering, corrosion, rust, galling, and seizing of metals. To eliminate this, I discovered a PTFE compound that when properly applied, eliminates these common hardware problems in marine environments. I call this compound TEF-GEL®. It’s space age design doesn’t break down in saltwater or detergents. TEF-GEL® has never failed me! I’ve sold this commercial grade product to the most demanding professionals at major equipment manufacturers, rigging company’s, and ship builders with complete satisfaction. This stuff is pretty remarkable. Will have to post update about its ability to prevent galvanic corrosion, but so far it seems to be doing its job. Using it on a motorcycle engine that has aluminum block and stainless fasteners. 45 year old engine had some fasteners that were seized and impossible to remove even with extractors. Didn’t want that same issue again, so I did some research and came up with this stuff. A little sticky to work with, but nothing that gojo won’t clean off your hands. 4 out of 5 stars But I believe this to be an excellent product. Did not come with use instructions. I called the maker and he said he will post a usage video soon. But I believe this to be an excellent product. One star deducted for lack of instruction with product or available online. 5 out of 5 stars Great way to prevent electrolysis galling of dissimilar metals. 4 out of 5 stars Top of the line product for Marine/water/application applications. 5 out of 5 stars Worth every penny! Incredibly effective at what it does. This is an incredible product. It’s not a high-speed lubricant and can’t be used in the presence of intense heat. E.g. no problem on your battery bolts; don’t use on spark plug threads… Otherwise it is the answer for everything: galling, slow-moving lubrication, seizing from rust or (especially) electrolysis, cannot be washed out, won’t evaporate, non toxic (as long as it doesn’t burn – it’s 40% pure Teflon powder, which is toxic if burned), will not actively contaminate paint like silicone, etc. For fasteners in aluminum there is simply no better option. 4oz will last a long time and will pay for itself hundreds of times with the problems you never end up having. Great, great product! 5 out of 5 stars There is nothing better..
for a salty marine environment where corrosion is viral. I am working on sailing boats and every time I use Tef-Gel on aluminum/stainless steel connections, I realize that I am doing that for the person who have to take it apart. Instead of cursing, drilling and tapping you just take the bolts out again. On my own boat maintenance became a lot easier and I hope the next time I have to take something apart, that the one who mounted it, used Tef-Gel. A four ounce tub is pretty much a lifetime supply for a weekender like myself, and worth getting as this is the cheapest way to acquire a volume of it. Its an amazing material and does everything it claims to. Many high end boat builders put this on all threaded fasteners. I now do the same. It is especially useful to fasten dissimilar metals, as it will deny galvanic corrosion. It simply cannot be washed away from the fastener by water or solvents. Excellent product! I have been using it for about 10 years in the marine environment it is amazing. I have not found anything else like it on the market. This is a must have item for salt water use. I love this stuff. I live on a boat, where corrosion is viral, especially on aluminum/stainless steel connections. Nothing I’ve coated with this has corroded, even after many years of salt water splashes. Makes maintenance into a relatively easy chore instead of a fight to the death with fasteners. I have the 20cc syringe which I purchased last year (that size doesn’t seem to be available right now). I’ve been looking for a suitable grease to use on my fishing reel drag washers. This lubricant is perfect to use on any carbon fiber drag washer. Just a light coating on each side of the washer does a great job if applied properly. It’s much thicker and stickier then any of the other lubes that I’ve tried for this application (“Cal’s, “Penn Bue Grease” or “Shimano Grease”)….very similar to the stuff that came with the old Newell reels. A little goes a long way. 5 out of 5 stars Really works!! I have been using this product for years on my ocean aluminum catamaran to prevent corrosion between the aluminum boat and stainless screws due to dissimilar metals. Screws come right out when needed!! Used it to attach Spinlock cam cleats with stainless steel screws to aluminum plate below the deck combing. Expensive, you don’t need a lot. 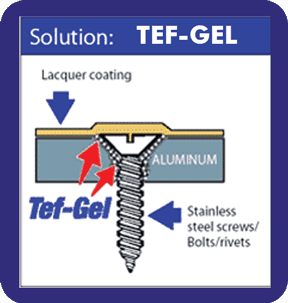 Don’t fasten stainless and aluminum without tef-gel. I use this to lube the polyurethane suspension bushings on my truck. Completely keeps everything from squeaking. Great product to have in every garage. It’s gooey and sticky enough to work great. 100% satisfied; delivered and performed as advertised. For an aluminum boat, always have Tef-Gel handy. I have an 36′ aluminum power catamaran and have tons of stainless screws throughout my boat. The builder neglected to prevent corrosion between the stainless screws and the threaded aluminum and I soon discovered major corrosion. I found Tef-Gel on the internet and took out every screw on my boat and applied Tef-Gel. to the threads. I reapply Tef-Gel every two years just for safety and have had no frozen fasteners in the last eight years. Saltwater has meet its match. Use it on all my reels. It’s very sticky but works well for me. film of Tef-Gel on the extended, visible part of the cable. It’s almost brand new. There is still some minor noise, probably because of built up rust, but I do NOT have to replace the cable! I only used half the applicator, and I’m sure I’ll apply some more after this season. It’s WAY better than lithium! a) Prevent corrosion between dissimilar metals i.e. stainless screws, bolts or rivets into aluminum (paint blistering, frozen fasteners, outboard motors). Outrigger slides, pulleys, rigging screws. Enable lifetime use of bearings in hard access like lazzarettcs and furling gears. Punches presses, drill presses (longer life, smoother operation). Propeller shafts to allow easy removal of propellers (especially splined shafts). Packing in glands to make stuffing box drip free. Use on all your battery ends in flashlights etc. to stop tin oxide formation, making your batteries last much longer. Many, many other uses! Cleans up with Mineral Spirits. Waterproof. Will not wash away.